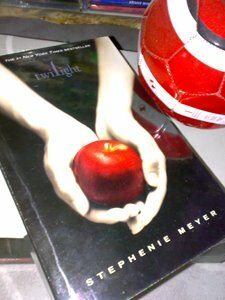 - Stephenie Meyer has stated that the apple on the cover represents the forbidden fruit from the book of Genesis. - A film adaptation directed by Catherine Hardwicke was released on December 12, 2008. - An Amazon.com "Best Book of the Decade...So Far"
- An American Library Association "Top Ten Best Book for Young Adults" and "Top Ten Books for Reluctant Readers"
I usually never buy romantic novels because I find them out of tune. But the moment I saw a copy of Twilight by Meyer everything was changed. I never expected it to be a great read at first and I only bought it because it tackles about vampire stories and such -- (I am planning to buy Anne Rice's books, but I choose to buy related books for young readers first). The thrill started when Bella Swan decided to live with her father, Charlie, in Forks, Washington. There she has garnered many friends and several boys in the school compete for shy Bella's attention. She was after all a nobody from where she came from and the great attention starts to dismay her. On the other hand, Bella crossed paths with Edward Cullen whom Bella developed an affection later on. Because of this Bella was then thrown into an ancient folklore she never thought existed. She became close with Edward that developed into love, love unlikely enough to occur between a vampire and a mortal. But things will not end as happily ever after for a new coven of vampires arrived at Forks. James, the leader of the wandering coven has developed a great urge to hunt for Bella. There the struggle of catch and chase lead to a cacophony of events from one place to another until finally James devised a trick that persuaded Bella to come to him herself. Bella was on the verge of death when Edward saved her from the blood-thirsty enemy. The story is a massive success that many has developed a liking to the series. It was after all a nicely narrated book based on Bella's perspective. It would certainly capture the reader from beginning to end and you would gladly race the minutes so as you could finish reading it. I certainly recommend this one.